LANSING, Mich., Feb. 11, 2019 /PRNewswire/ -- Montmorency tart cherry juice helped lower systolic blood pressure and LDL or "bad" cholesterol in older adults by reducing certain biomarkers of inflammation and oxidative stress in older adults, according to a new study published in Nutrients.1 Larger and longer follow-up studies are needed to confirm these findings. In this randomized-controlled clinical trial, 34 men and women between the ages of 65-80 years drank either 8 ounces of Montmorency tart cherry juice or a control beverage twice a day for 12 weeks. At the end of the 12 weeks, participants in the tart cherry group had lower systolic blood pressure and LDL cholesterol, as well as lower levels of certain substances in the blood that indicate inflammation and oxidative stress, including the biomarkers of c-reactive protein (CRP) and malondialdehyde (MDA), compared to the control group. 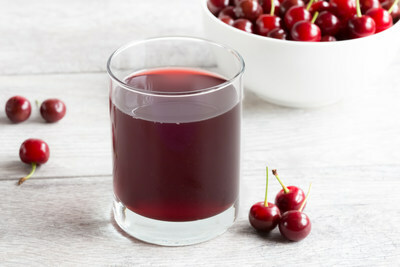 The participants who drank the 100% tart cherry juice also exhibited increased DNA repair activity of OGG1, or 8-oxoguanine glycosylase. Compared to the levels at baseline, the participants drinking tart cherry juice lowered oxidized low-density lipoprotein by 11%, CRP levels by 25%, and MDA levels by 3%. Baseline levels of additional biomarkers of inflammation and oxidative stress, including nitric oxide, tumor necrosis factor-alpha (TNF-a), plasma 4-hydroxynonenal (4HNE), plasma 8-hydroxydeoxyguanosine (8-OHdG), angiotensin (ANG II), and endothelial 1 (ET-1) were not statistically different between the tart cherry and control groups. "Our findings suggest Montmorency tart cherry juice may be a good addition to a heart-healthy diet," said lead researcher Sheau Ching Chai, PhD, RD, assistant professor in the Department of Behavioral Health and Nutrition at the University of Delaware. "The compliance rate of our participants was quite high, at 94%, suggesting that a cup of tart cherry juice twice a day can easily be incorporated and enjoyed in an overall diet." The participants consumed 16 ounces of Montmorency tart cherry juice daily, which contain 181 calories and 34 grams of sugar—lower than other commonly consumed fruit juices and soft drinks—but the juice did not change participants' body weight, insulin levels, or insulin resistance. This suggests that Montmorency tart cherry juice can easily be incorporated into the diet without increasing calorie or sugar intake, especially if consumed in place of sugar-sweetened beverages. Dr. Chai and colleagues at the University of Delaware published the research on tart cherry juice in two phases, reporting the original findings regarding its effects on blood pressure and LDL cholesterol in Food & Function.2 This second phase of the study was designed to understand the observed mechanisms behind the blood pressure and LDL cholesterol-lowering impact of tart cherry juice reported in the first phase. The researchers indicate that the present study is the longest-term human trial that has examined the potential health effects of tart cherry consumption. The Cherry Marketing Institute, a not-for-profit organization funded by U.S. tart cherry growers and processors, provided financial support for the study, but had no role in the study design, data collection or analysis, or preparation or decision to publish the manuscript. CMI's mission is to increase the demand for Montmorency tart cherries through promotion, market expansion, product development and research. To learn more about previous research studies on Montmorency tart cherries, visit ChooseCherries.com. 1 Chai SC, Davis K, Zhang Z, Zha L, Kirschner KF. Effects of tart cherry juice on biomarkers of inflammation and oxidative stress in older adults. Nutrients. 2019;11(2). 2 Chai SC, Davis K, Wright RS, Kuczmarski MF, Zhang Z. Impact of tart cherry juice on systolic blood pressure and low-density lipoprotein cholesterol in older adults: a randomized controlled trial. Food & Function. 2018; 9(6):3185-3194.